Starting an eBay business is easy. Would you like to start a business that can make some extra cash? Do you want to replace your present income? You can do either with eBay! One of the main reasons selling on eBay has remained popular is because it's still easy for anybody to use. If you have a checking account and email address, starting a business on eBay is a breeze. 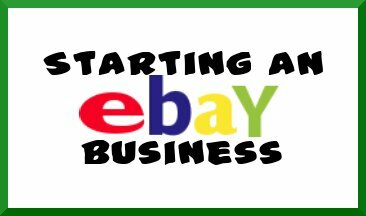 For someone wanting to own a home-based business, an eBay business is perfect. It's a simple way to learn how to run a business. I'm an experienced eBay seller... let me share some eBay selling advice with you. What sells on eBay - Learn what to sell before starting your eBay business. Business name - Tips about choosing a name for your eBay business. Ebay home business - 10 things you need for your eBay business. Free eBay templates - Free eBay templates to make your auctions stand out. Free eBay template - Where to find a free eBay template. Ebay news - Keep up on the latest eBay news. Ebay coupons - Learn more about eBay coupon deals and promotions. Ebay scams - Protect yourself and your eBay business from scams. Ebay alternatives - alternatives to eBay. 'nuff said. This sounds like a lot of work, doesn't it? Well, starting ANY business IS a lot of work! This "tried & true" eBay selling advice is meant to get you thinking about ALL the details. Only someone experienced with selling on eBay (like me) can point out common problems that new sellers may run into. Starting an eBay business that makes money is possible if you think, plan, and work hard. It's worth the effort. Hope I see you on eBay!